Earlier this summer, I had the wonderful opportunity to attend BlogFest at IDEA World in Las Vegas. Not only did I meet some of the best fitness bloggers in the country and hang out with some of my Dallas Fitness Ambassador family, I also got schooled on the latest in plantbased protein at the Expo. Walking the aisles of the exhibition floor, I saw everything from sweet potato-based noodles to Daiya’s yummy desserts. The company that caught my eye was 22 Days Nutrition. Their premise is that it takes 21 days to create a habit and they want to help everyone get to the 22nd day and achieve a major breakthrough. Founder Marco Borges is a vegan and an exercise physiologist who was constantly searching for a solution for optimum wellness so he formulated the perfect vegan options for folks trying to “transform their lives, bodies and habits.” Plus, Marco was the trainer that helped Beyoncé and Jay-Z when they went on their 22-day vegan journey a couple of years ago. I thought to myself “If he can help the Queen B, how much of a glow up could I achieve?” I reached out to the 22 Days Nutrition team, eager to try more products after tasting the sample of their protein bar at IDEA World, and they obliged by sending me their vanilla protein powder and several flavors of their protein bar: Chunky Peanut Butter, Peanut Butter Chocolate Chip, Salted Caramel, and Fudge Brownie. Below is my review of the powder and bars, which are my own opinion and not influenced by 22 Days Nutrition. I enjoyed the variety of flavors from the bars, with Peanut Butter Chocolate Chip being my favorite and probably Salted Caramel as my least liked. The PBCC had the perfect balance of salty peanut flavor to the sweet of chocolate. I ended up grabbing bars when I was on the go, running from teaching a class to making a proposal for clients, and it kept me full and energized. 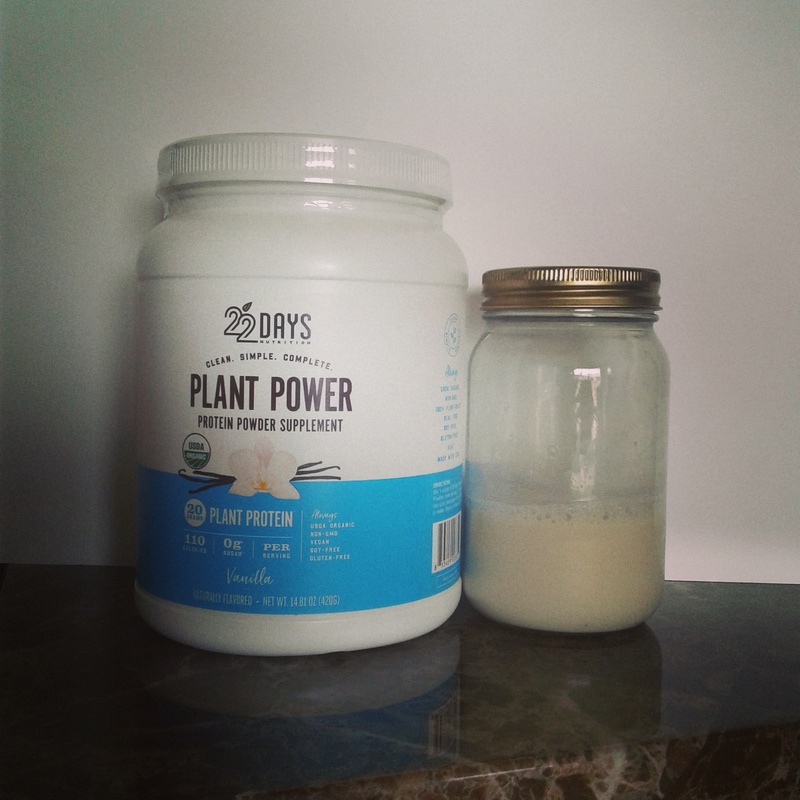 The 22 Days Nutrition Plant Power vanilla powder was one of the tastiest I’ve had. I tried it in a simple form by shaking it into 8 ounces of almond milk and I blended it with a fruit smoothie. Either way, it’s excellent. The powder gave my drinks a nice protein boost and was easy to blend and take with me on the go. For those who are concerned with getting “enough” protein from plantbased foods, rest assured that 22 Days Nutrition has you covered. The powder has 20 grams of protein per serving from pea protein, and the bars are 15 grams a piece. The texture of the Fudge Brownie protein bar didn’t sit well with me at all: chalky and chewy. Interestingly, this didn’t translate to the other flavors. Tip: don’t leave the caramel bar in a hot vehicle! I learned the hard way (insert sad face). As with most protein powders, when you’re shaking it together with a liquid – as opposed to blending – a shaker ball is recommended. I do not have one of those so I had to make do with the coil from my tofu press. Bootleg but it worked; three cheers for ingenuity. I would recommend the bars and powder to someone who is struggling with finding enough meals throughout the day or someone who isn’t a big meal planner (raises hand). 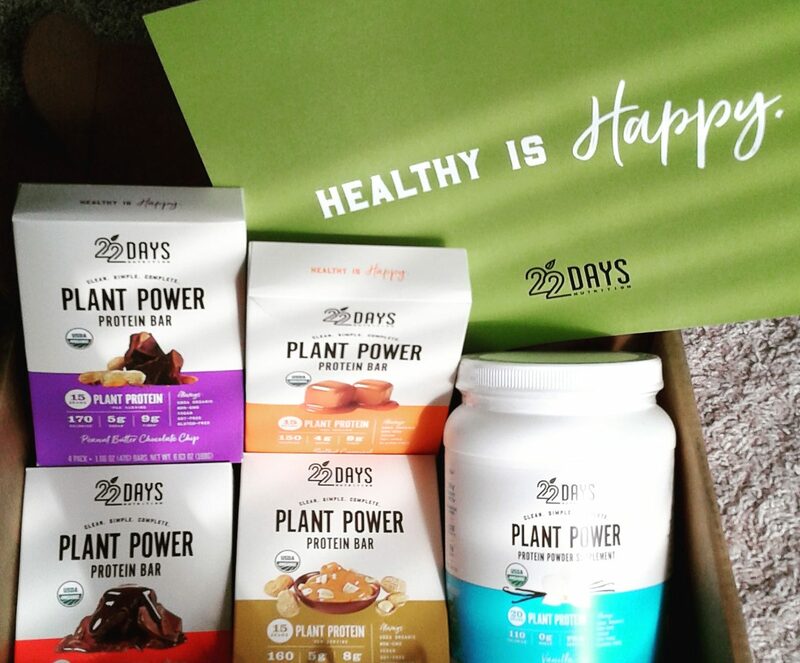 Flavors were on point and with the advancements in non-soy plantbased protein sources, 22 Days Nutrition is right up there in delivering the goods for those with soy sensitivities/allergies or if you want to keep your soy intake low. 22 Days Nutrition is giving one of my excellent readers a 4-pack box of protein bars in my favorite flavor, Peanut Butter Chocolate Chip. Enter below for your chance to receive yummy protein bars courtesy of the 22 Days Nutrition team. Must reside within continental United States to qualify. Must be at least 18 years of age to enter. Winners will be selected and verified. Don’t want to wait on your chance to win? You can find 22 Days Nutrition products at your local Target! I know you already had your next #TargetRun planned, so be sure to put a box of protein bars or a canister of powder in your cart. I’d love to hear from you about your experience with plantbased protein bars and powder. Have you had 22 Days Nutrition before? Talk to me in the comments! I love protein bars because of their convenience while traveling. I love protein bars because they give me that added punch of protein before a workout or family outing! I love have a ready to eat meal or snack with me, love that I can throw a bar or a couple of bars in my purse and have a healthy snack with me at all times. I need protein bars to keep me fueled up! I think they are an awesome snack. They fill me up. I love the convenience of protein bars because they’re quick meal replacements and provide good nutrients to tide you over til your next meal if you’re in a hurry. I eat high protein bars every day for breakfast. Can’t wait to try these! Being a person on the go, they are nice to have. Many times a protein bar has saved me from a unhealthy trip. I love that I can grab and go! I can easily get extra protein. The convenience of protein bars for me is being able to eat something quick that keeps me going with a boost. I have 5 little ones I stay home with so meals for me are hard to sit down and eat. I like that you can carry them with you and they’re a quick on the go breakfast or snack! Thank you so much for the chance to win! Protein bars are great snacks for work. Previous PostPrevious Is Vegan Protein That Looks, Smells and Tastes Like Meat Unethical?